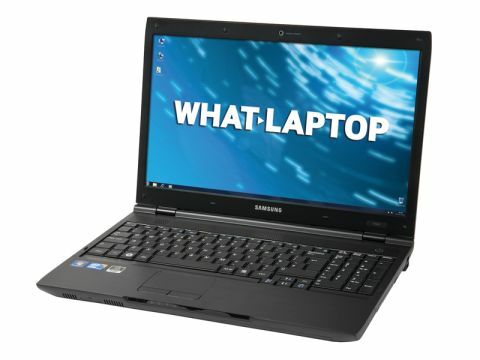 The Samsung P580 is a reasonably priced professional laptop aimed at mobile business users. We were impressed by the machine's overall quality, with only a minor usability flaw detracting from the otherwise attractive package. A smart black business design has been used throughout and it's appropriate, although not particularly inspired. The rubberised lid surface provides a good grip when carrying and prevents fingerprints showing, while the inside features a brushed-metal finish that looks good and adds to the solid feel. The chassis is durable enough for a life on the road, with no clear flex in any area and anti-shock protection for the 320GB hard drive. A weight of 2.5kg and the slimline build means you can comfortably carry this laptop around all day, although the 196-minute battery life is merely average. If portability is a priority, there are better business laptops around. Performance is assured thanks to the Intel Core i3 processor, so there's easily enough power on offer for multi-tasking with the most intensive office applications. At this price we would have preferred a Core i5 CPU, however, for extra future-proofing. Graphics are handled by a dedicated Nvidia graphics card with 512MB of dedicated video memory. While the latest games will only run smoothly on lower detail levels, this is more than enough power for professional design and multimedia applications. The widescreen 15.6-inch display is bright and comfortable to work on for long periods, with excellent contrast levels. There's no glossy Super-TFT coating and, although images aren't quite as vibrant as a result, the display isn't reflective, making it perfect for outdoor use. A full-sized keyboard with a separate numeric keypad is in place and for the most part it's a well-built board with firm keys and decent travel. However, we found that the spacebar occasionally didn't register if pressed near the edges. We needed to adjust our typing style to compensate, which was a little irritating. Plenty of ports are on offer, including VGA, HDMI and even a Serial Port. Four USB ports provide lots of room for adding peripherals, with one doubling as an eSATA port and another offering Sleep and Charge functionality for charging portable devices. A docking port is also available underneath the laptop. The Samsung P580 has a fair amount to offer professional users, with a worthy specification and solid range of features. The TFT display is perfect for working on the move, and the strong overall build quality is only let down by the dodgy spacebar.